I cheated a bit for this blog post. As you know, I usually only review graphic novels. 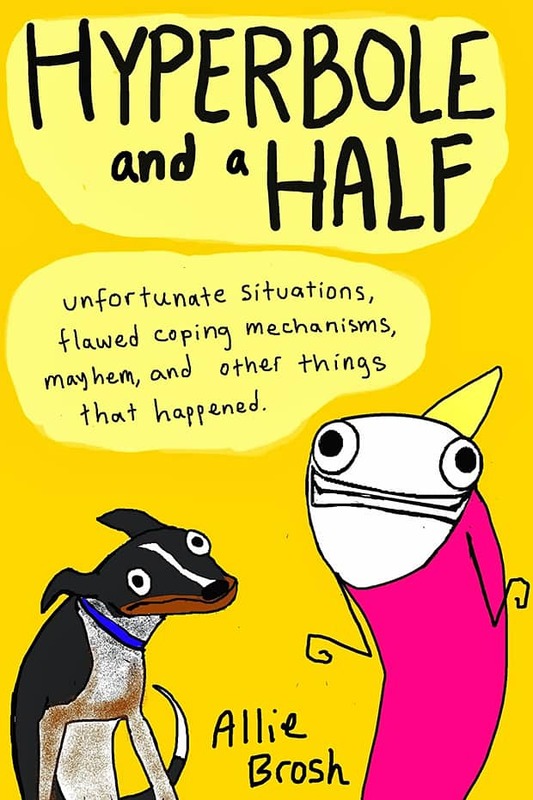 This time I'm reviewing a graphic novel that you may be familiar with as a web series, Hyperbole and a Half by Allie Brosh. It collects some of the best stories from her autobiographical web series. The way she draws is utterly hilarious. It's a crazy style I'm sure you can't find anywhere else. Her art style and writing style can even make serious things funny. Her longest story is all about depression and it's still a little funny. I really like the story called "God of Cake" about her 4-year-old self trying to steal and eat the cake her mother made for her grandpa's birthday. She really depicts a child's mindset, like when she imagined herself dead because she didn't get the cake and it was all her Mom's fault. That is a hyperbole. It's perfectly realistic behavior for a child who didn't get what they wanted. Link to story. Allie wore for her second Halloween that she could dress up for. When she put on the costume she felt like she was the dinosaur, and dinosaurs cause chaos. She constantly feels a need to put on the costume and cause more chaos. link to story. thinking, it's like a completely different language from what the people are saying. Whenever Allie is talking or thinking, its just plain text, but when Simple Dog thinks, there are colors and shapes everywhere. The art in this series doesn't need words to be funny. You could look at three wordless panels and burst into laughter. This book has a little bit of bad language. I think that if you're able to handle the F word, then you can handle this. The art work is really really funny, the stories are even more funny, and it's free to read online! Just like my blog! You may be thinking, "why would I buy a book that is just a collection of things I could read for free online?" Well, because you need Internet to read online, and that mean that you can't read her blog outside of the comfort of your own home. You can read the book if your Internet is out, you can read the book on the train and you can support Allie Brosh with your purchase. I would give Hyperbole and a Half 5 pointy pony tails out of five. Great review! Well written. So great, I re-blogged it on facebook! I'm a huge fan of this book myself. I actually bought five (5!) copies this Christmas and gave them to several people. 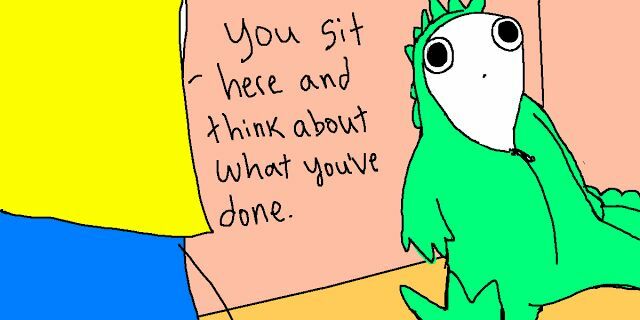 I even let my 11-year-old stay up half the night reading it, despite the fact that Allie Brosh does swear like a sailor at times. I also love her drawings. There's a video interview with her at the nytimes.com that's interesting. Her drawings, it turns out, are very carefully done. Great review, as always! I also love this blog, and I really enjoyed reading your review! Especially because I understand it was written under some duress! Keep on readin & writin, man! An excellent review, especially since it perfectly reflects my own reaction to Allie's book and blog. I gave it to my daughter for Christmas, reasonably confident that she can handle the F word. What a fine review. I especially liked your thoughts on Simple Dog who is my favorite part of the series. 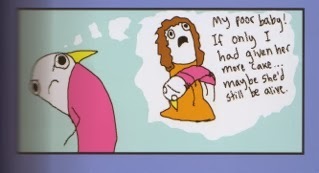 I'd read Allie Brosh's work before, but now I'll definitely buy the book. Thanks, Graphic Novelologist! Your blog is awesome. I'm a 40-something college professor and graphic novel addict, and I love your blog. Just wanted to let you know. You are being read by way more people than you likely realize. Commendations to you, good sir! (and I postscript Mr. Anonymous of January 22, 2014 at 6:27 p.m. Graphic novel addict, check. College professor, check. 40-something, um yeah whatev. Okay I admit it. Awesome? A+ for you. Memes on legs is a perfect description. I really love the art and the humor of these books. And I can definitely handle the F word so I plan to invest. I am wondering if you ever draw since you seem to be a true art lover. I can't remember where I first saw "Hyperbole and a Half" but now I see it everywhere. Glad you got around to reviewing the book and can keep spreading the word up, so to speak. Funny works. Your posts improve with each new review. I thoroughly enjoyed the way you referenced the stories - given that I am not familiar with the series, this was easy for me to follow. 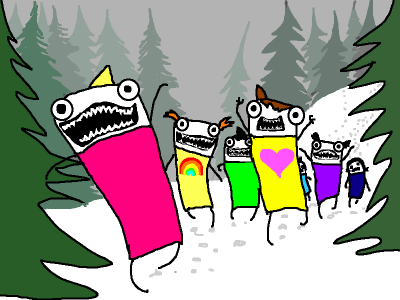 I have read xkcd and SMBC Web Series, and your review has me wanting to check out Hyperbole and a Half. I'm glad you read and reviewed this. It made me feel like less of a slacker mom for letting my 12 year old read it. She cackled like a loon the whole time, though, so it was okay in my book. And as a nearly-old lady, it's one of my favorite books ever. I could read the dog stories (and The God of Cake) every day and still laugh at them. Definitely makes me want to read the book. I too gave it as a Christmas gift when I heard her on NPR -- now I gotta read it!! Fabulous review, Milo! Those two stories - God of Cake, and the Dinosaur Costume Story - were also my favorite. I love how she portrays the fierceness of kids. Your review made me want to read those stories again. Keep up the good work! Five pointy ponytails out of five **guffaw** Nice ending! For the first many times I read the blog I thought she just always wore a party hat for some reason. I LOOOOOVE Hyoerbole and a half! Thank you for writing about this, Milo! She's hilarious; when I read the book at forbidden planet, I kept getting funny looks from my laughing so hard. You really are improving as a writer; keep up the fabulous work!